Authoring assistance tool that helps to create rule-compliant and style-compliant text. Available for Microsoft Word and other editors. Customizable proofreading software. Implements many advanced rules in particular for English and for German texts. Better than some standalone spelling and grammar checkers, particularly for the English language. Also comes with a fairly good syntax checker. Checks for a large number of issues. Especially aims at improving the clarity of your texts. Looks for more than 50 types of writing mistakes and identifies weak style such as unnecessary words that you can omit. Searches for grammar errors and weak writing style. Provides a vast scope of different analyses. Only works when you’ve installed English versions of Microsoft Word and Windows. Performs some basic checks such as sentence length, repeated words, and wordiness. Provides a corrector, dictionaries, and language guides. English grammar, style, and contextual spelling checker. Available for a variety of platforms such as WordPress, Confluence, Firefox, Chrome, and OpenOffice. Highlights lengthy, complex sentences in English texts as well as some common grammar errors. Web-based proofreader that corrects contextual spelling mistakes, checks for grammar errors, and enhances vocabulary usage. Advanced analysis tool to improve the readability of German texts. Basic analysis tool to improve the readability of German texts. Extracts terms from documents to help crating terminology databases and glossaries. Extracts terms and creates terminology records from source and target document pairs and translation memories. Toolbox for terminology extraction and multilingual term alignment. Builds tables of all acronyms that are used within a Microsoft Word document. Ensures consistency with house styles and between multiple authors. Requires Microsoft Word. Helps to make sure that text conforms to ASD Simplified Technical English (ASD-STE100). Uses LanguageTool. Scans a translation memory and suggests writers identical or similar text fragments (sentences, single or multiple paragraphs). Simple terminology management system. Can import existing glossaries. Utility for creating terminology lists. Guides writers to create content that’s accurate, consistent, search-ready, and translation-friendly. 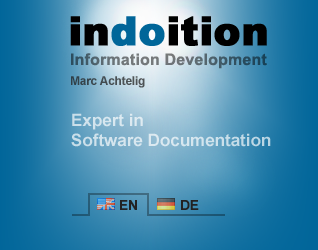 Quality assurance software for standardized documentation. Ensures compliance with corporate terminology and style guide rules. Software solutions for the creation, management, and dissemination of corporate languages. Combines a full-text search engine with various translation and terminology tools. Monitors technical texts for compliance with Controlled English or ASD-STE100 Simplified Technical English. There are versions available for FrameMaker, Microsoft Word, Arbortext, XMetal, and UltraXML. Checks the consistent use of terminology in Adobe FrameMaker, Adobe InDesign, Microsoft Word, and Powerpoint. In other editors you can check terms via the included Finalyser Clipboard Listener. For the creation and maintenance of the connected database, you can choose between an XML database and a UniTerm database. Also supports the inclusion of foreign languages. Online database that helps you to collect, develop, and apply your organization's terminology. Helps to reuse existing phrases and wording to improve consistency and to lower translation cost. Companion and style guide through all stages of a user assistance project, from the analysis of requirements through structuring the content and designing templates, writing, illustrating, proofreading, and translating. Reads text files, Microsoft Word files, OpenOffice files, and HTML files, and then generates word frequency lists and concordances from these files. Can spider a whole web site or browser-based help system. Corpus analysis toolkit for concordancing and text analysis. Automatically capitalizes a heading according to AP style, APA style, Chicago style or MLA style. Tables to copy special characters from. Categories include Letters, Punctuation, Math, Numbers, Currency, Symbols, Arrows, and Emoji.